Our church took a week at the end of April and focused on the World’s need for Jesus. Missionaries that our church supports came from around the world and spent time sharing about what they are seeing God do “back home”. Growing up with a Missions Pastor for a daddy, well you can imagine how much I love this week. I was asked to help in some way and I picked the welcome baskets. I contacted the office of the aforementioned Missions Pastor and asked them what they put in their welcome bags. I compiled a list and added to it what our gal put in last year and “wah-lah” the search content for a Pinterest board was created!!! Hindsight is 20/20 and if I’m asked to do this again next year I will gladly say “YES!” and use different parameters for what I include. 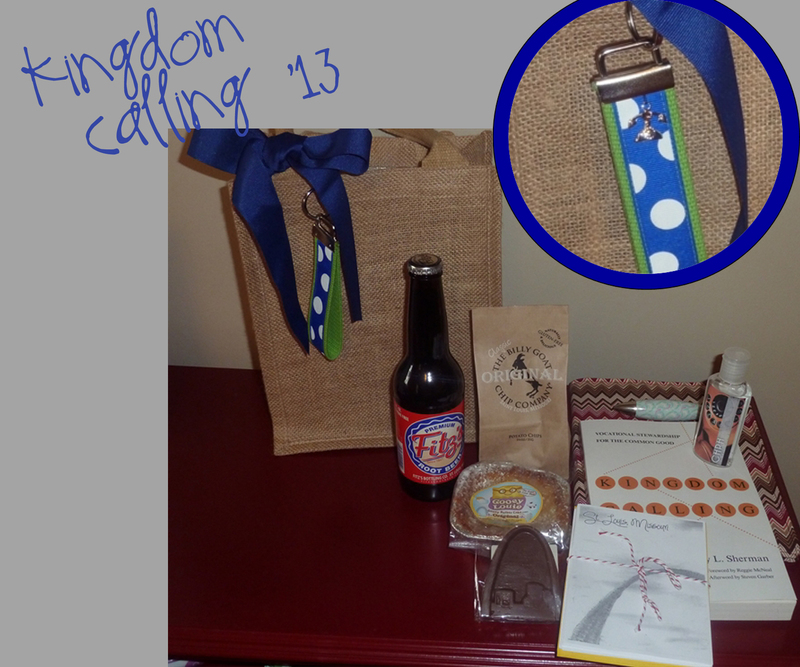 The theme was “Kingdom Calling” and, honestly, I went a little crazy on this first go-round. I tried to think of things that are locally made so that the visitors could have a “taste” of St. Louis. So we included Fitz’s Rootbeer, Gooey Louie Buttercake, Billy Goat Chips, and Dad’s Cookies’ Chocolate Arch. There were Arch notecards drawn by a church member too! After the local items were chosen I tried to think of things for the wife and husband to enjoy. . . something they would use. For the women there was a key fob, with a little phone charm to remind them where it came from. The missionary bags were due to the missions lady on April 16 and then on April 17 I was to deliver the gift bags for the teachers at Promise for Teacher Appreciation Week. 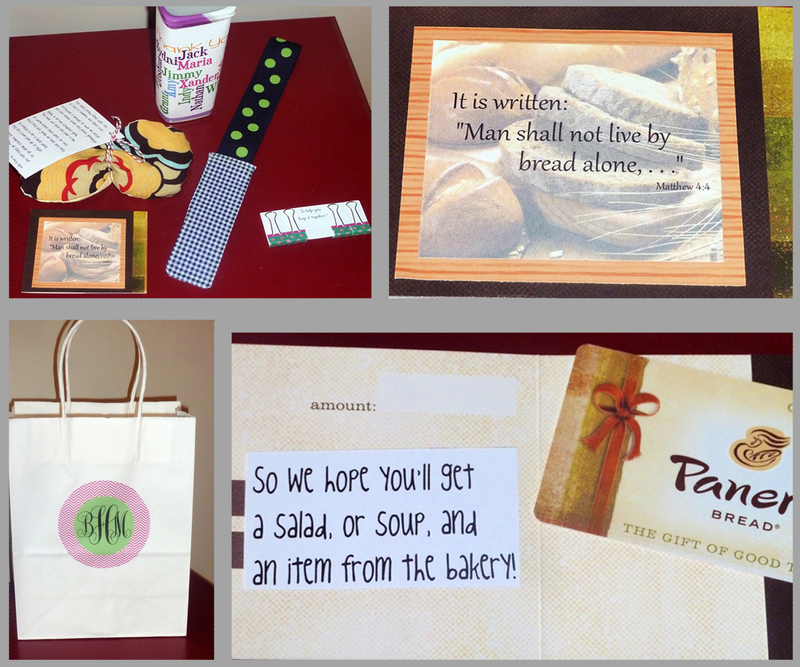 Every teacher received a gift card to Panera, lemonade mix with a Wordle cover, a heating pad eye mask, cutesy binder clips, and a bookmark. The bookmark is awesome and I kept one for myself. *wink* Everything went into a “monogrammed” bag and was delivered with a smile. My kids were thrilled when I was finished but I loved having a project to work on and a need for creativity. Throw in loving on people I am thankful for and WOW!! What a treat for me! I want one of YOUR gift bags! Great ideas!